Thanks for reading our blog! To see older posts about our farm antics, please use the link on the right hand sidebar. Summer CSA Shares For Sale - January Discounts and Deals! Posted 1/12/2015 5:08pm by Elaine L. Lemmon. Everblossom Farm Summer 2015 CSA Shares are on sale now! We are so excited to offer our organic vegetables to you, so we have created discounts for early registrants! Huge early bird discounts now through the end of January! The Standard Share gets the worm!!! Yuk. What I mean to say is Standard Share members can get an early bird discount. Enter coupon code EARLYBIRDsmall for a Small Standard and you'll save $32 or EARLYBIRDlarge for a Large Standard and you'll save $52! Standard shares mean that we choose what will go into your bag each week. You will get the same delicious veggies that other types of CSA members enjoy, except you don’t have to decide what you will get. You just sit back, relax, and let us make all the decisions! You'll find a full description of this share type and others at this link. If you'd like to see some examples, visit our Examples of CSA Shares page. More questions? Check out the new FAQs. We have you covered. Don't hesitate - these discounts are for a limited time. What better way to provide your family with a healthy, delicious meal while teaching them how to support the local community at the exact same time! It's never been easier - choose your shares, select your pick up location, pay online, and watch the produce roll in. Posted 12/22/2014 10:02am by Elaine L. Lemmon. Winter is an intense, and amazing time of the year to eat locally. As you've probably noticed in your boxes they are loaded with greens and beans. These are some of the hardiest and most nutritious vegetables around and we are so lucky to be able to grow them all year round. With a little research you can make some really neat recipes with these base ingredients and give your family one of the healthiest meals around! In the winter our greens keep on growing strong! They tend to get a nice sweetness from the freezing cold temperatures that they are surviving and thriving in. Our greens are nutrition rock stars! The heirloom bean varieties we have are great as well! They have been passed down from generation to generation in order to preserve their delicious flavor and gorgeous markings. You rarely see these beauties in the grocery store which makes them even more of a delicacy! Some of our amazing CSA members, Michelle & Tony, were kind enough to send in this recipe. It really brings out the flavors of the Kale and Jacob's Cattle Beans. I think that this would be a great addition to any holiday event. Michelle & Tony, thank you so much for sharing! You are awesome! Have a favorite recipe for your winter veggies? Send it in and maybe you'll be featured on our next blog! Additional notes from Michelle & Tony: I made this recipe with a few omissions (celery, red pepper) and changes (light cream instead of heavy and half the goat cheese), but it is just delicious!!! Posted 10/20/2014 10:35am by Elaine L. Lemmon. I've been reading it everywhere… "Eat more dark leafy greens and fresh vegetables!" It's easy to do with a Winter CSA membership at Everblossom Farm. We have exactly what you need to stay healthy and feeling great in the cold, dark months. Every share comes with dark greens and we even have a specific Greens Share that stands alone or adds nicely to our Frost Protection Standard Share, which is a mix of greens and roots. For ideas of what's included in our standard share, check out Examples of Weekly Shares and scroll to the bottom. NEW! This year we have a Buy Down Share where you can choose exactly what you'd like, and we'll pack it up and deliver. Also exciting is the news of our new delivery locations in Harrisburg. (Details are coming soon to the website.) A York delivery location is on deck - we just need a few more members in that city. Spread the word about our Winter CSA and we will too. Join us!!! Check out our options under Member Sign Up and our schedule for deliveries under Download Files and Forms. Our mission is to provide you with superior quality food and maintain our farms environmental and economic health, while respecting the beauty of the physical and spiritual aspects of our farm and community. Posted 10/3/2014 8:53am by Elaine L. Lemmon. Exact start and end dates are negotiable. Longer-term employment and a permanent position is available (this is based on employee’s performance, farm’s success, and discretion of farm owner). If identified for a longer term position, you will be granted greater responsibilities and, following the appropriate training period, will be given creative license to fulfill those responsibilities; the management position can be paid a higher rate due to the drive and capability of the individual. Full time work during peak season (May 1-October 31) is 60 hr/wk, off season hours are between 40-50 hr/wk. As this position is managerial, the employee may work some weekends. operation of large and small tractors for cultivation, harvest, and tillage. operation of small engine equipment such as mowers, trimmers, walk behind tractor, etc. ; assisting with livestock management (e.g., feeding, cleaning, caring for, rotating, and processing pastured poultry). Imperative: Timeliness; Hustle; Capable of clearly communicating questions, concerns, and needs; Strong Work Ethic; 1 full year of experience on an organic vegetable farm in PA or the neighboring region. Important: Balance attention to detail and a quick work pace; Willing to work outside in any weather; Maintain positive attitude in stressful conditions; Experience with manual labor/long, physically demanding work days; Varied tractor experience with ability to change out implements and troubleshoot with patience. Preferred: Understanding of sustainable/organic poultry operations; Flexible on learning./training styles; Ability to handle constructive criticism at performance review sessions with grace; Accept and promote a communal living space; Experience managing a crew, keeping others on task; comparable leadership roles. Housing in our large historic farmhouse full of modern amenities. Residing on the farm is a requirement. Be advised that No pets are allowed; Vacation time is available, but must be planned well in advance and not scheduled during peak season; There will be performance review sessions between the farm owner and the employee within the first six months of employment; Employees must contribute personal time to house cleaning, cutting firewood, landscaping, etc. ; and no smoking nor illegal drugs are permitted in the house or on the property. Elaine Lemmon, farmer/owner elaine.lemmon@gmail.com 717-253-7797. Provide resume, cover letter, and 3 references via email. Review of applications begins immediately. Positions will remain open until filled. Phone/video interviews and farm visits will be arranged with qualified applicants. Posted 9/19/2014 9:01am by Elaine L. Lemmon. Howdy folks--big news here! Huge tomato blowout tomorrow only at the farm! please note that all the tomatoes are seconds, which are perfect for canning, saucing, salsa creations, and creating whatever other wondrous things you want. Just a reminder that on Sunday, we have our Fall Fest party! 1 to 5 pm. Bring a dish to share, a chair, and a healthy sense of fun. No Debbie Downers, please. Posted 9/14/2014 1:42pm by Elaine L. Lemmon. Good afternoon fresh food lover! Fall is here (at least it is for me) and it's time for you to check out our Winter CSA options if you're one who craves hearty, nutrient-rich veggies in your winter dishes. We have several options available: the standard share called Frost Protection, a "Buy Down" Share, where you decide your starting balance and order weekly, OR a combo of the previous two options: we are calling this the "Bonus Package" because of the discount, and finally the Greens Share. Don't hesitate! We have limited availability for these exclusive and popular shares. Winter deliveries will begin the first week of November. Don't hesitate! We have limited availability for these exclusive and popular shares. Thanks for your support! Fall Fest Farm Party Alert! Posted 8/29/2014 8:31am by Elaine L. Lemmon. 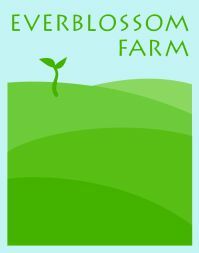 In less than a month, Everblossom Farm will be holding its annual Fall Fest to celebrate the start of autumn! Please come visit us Sunday September 21 from 1 to 5 pm with a potluck dish to share, some chairs/blankets, and your kids. Like I noted for our last farm party, please do not bring your pets. It is a working farm with lots of trucks and cars passing through-it is not a good environment for an unfamiliar pet. We will be providing the beverages, burgers, and some games for the kids. But we encourage you to bring any lawn games--boccee or corn hole anyone? If you love apples, we have children's apple bobbing planned, and for all the artistic children out there…it is time for a seed collage! We have an abundance of dud seeds, so I can't wait to see what the kids create! If you guys can bring the construction paper and glue, we can sit the kids down for some Art from the Earth. Posted 8/4/2014 1:11pm by Elaine L. Lemmon. I always joke about our "catch and release" principles here on the farm. We bring in some winners of people to work with us seasonally, and then turn them loose into the wild to use what they've learned here. While I do feel this works well since the bulk of our work load is seasonal, I definitely have plenty of great work and learning opportunities for employees all year long. So our summer season folks are heading back to college and we're looking for a good crop of new, young go-getters to dive into our bountiful fall harvest and winter CSA. If you know a young person who would love to live on my farm and learn all there is to know about growing awesome organic produce, please send them my way. If you're a local who doesn't need housing, but would enjoy being able to have your hands in fresh soil all winter long, get in touch. In addition to our Winter CSA, we have markets to attend all year and wholesale accounts that never dry up. As you can imagine, we keep a steady pace even in the dark and cold months! Feel free to call or email with job inquiries and keep your eye on our website for a full description of the work we have available. Posted 7/18/2014 8:51am by Elaine L. Lemmon. I'd like to humble brag some more items that are in the cooler currently; last week we featured black raspberries and I hope you rose to the challenge to incorporate them into your meals. I did forget to mention that raspberries cook down very easily into a compote that you can add as a topping to any treat in any season; simply freeze the compote and add 2-4 tablespoons of water when you reheat it on the stovetop. This week I am giving you one of Eric and my favorite recipes with summer squash. Use a mandolin (CAREFULLY) to cut your larger squash pieces into ribbons, brine them, and then use them as noodles. You can add them them to any hot or cold dish, as they are very versatile. *As I have heard countless horror stories from ER nurses/drs about misusing a mandolin, here is a video about safe mandolin use. If you have a steady hand, use a paring knife, or a regular vegetable slicer. (http://www.finecooking.com/videos/how-to-use-mandoline.aspx) Like this video shows, find a tool that includes a hand guard! Let's chat about potatoes…we remove 90-95% of soil from our little buddies, but we do not wash them as that decreases its ability to store for any length of time. Please store them in a cool, dry place with the soil still on them. Only wash them if you plan to eat them that night. Same policy for berries-wrap them in a dry paper towel and put those in the fridge until you want to eat them, then GENTLY rinse them. Please note that we have several varieties of potatoes that make great presentations, as well as add some flavor into your potato salads, homemade chips, or attempts of the Spanish "tortilla." (Takes some time to master but ohhhhhh God, it is worth it.) https://www.youtube.com/watch?v=S3v7WbV1R2g. This youtube series comes from a Japanese mom who takes classic dishes from every culture and has her toddler daughter eat them-it is super easy to replicate and the daughter is adorable! (squeeeee! This info comes from part-time employee Alana) Cut the potatoes very thin and in smaller pieces so that it doesn't weigh down the egg mixture. And use a large spatula to flip it because a small one causes it to break apart or fall out of your pan (Alana achieved both of these failures). Another item that we should highlight is the kohlrabi. Its knobby shape is not for smacking unruly teenagers, but rather, eating. Its flavor is between cabbage and broccoli stems. These recipes came from www.thekitchn.com: raw in salads (similar to mustard greens); added to cream of potato, broccoli, or mushroom soup (or in its own creamy, pureed soup with some mild spices); fritters; roasted; or steamed. After meeting with people from across the world, I have found that slavic cultures use kohlrabi almost interchangeably with cabbage (cabbage soup, coleslaws, sauerkraut), as it is so versatile. Remember that my sister, Jode, helps log many of her recipes and they are fantastic. Just click on the recipe link on the blog and you can explore hundreds of options if you are stuck on what to eat or how to prepare something. Look for a post in the coming weeks that gives you all the information you need to know on a HIGHLY INVASIVE PEST called the Spotted Wing Drosophila, i.e., the fruit fly. These jerks are causing millions of dollars of damage across the north east, mainly in berries, and we are doing everything we can to control them in an environmentally safe manner. As I will explain later, we go beyond the Organic recommended control methods to one that uses no spray-we lose product this way, but it is a method that keeps me from losing sleep at night. Enjoy this humidity free weather and eats lots of berries and veggies this week! Its great weather to grill meats, skewer some veggies, and make a pie. Posted 7/11/2014 9:06am by Elaine L. Lemmon. It is dry out here and we are busy installing and controlling our irrigation systems to make sure our produce stays fresh and perky! You might think that with our minds on the lack of rain we've had, we might be forlorn, BUT NO! There is a party to be enjoyed, with delicious food, quenching drinks, and a farm tour or two! This is our final reminder that the CSA part will be here on Saturday (the 12th) from 3 to 6 ish. We want YOU to bring yourselves, your kids, and a potluck dish to share, as well as a chair or blanket. Please no pets. We got those already and Route 94 hosts incredibly fast drivers with little to no regard for life. Thank you to everyone who supports us through CSA and shopping at our market stall. It's your loyalty that keeps us going and we are grateful. Keep an eye out for raspberries. My favorites are the black raspberries, the smaller berry with a ton of flavor. It is more seedy but it is worth it (seeds are good for you-fiber y'all!) I eat them raw, but if you are the kind of person who likes to bake, they make exceptional berry tarts with a light pastry crust and homemade whipped cream as a topping. Or add them to your smoothies in place of artificial sweeteners. Popular sentiment is with the red raspberry, but I think the blacks taste great, and lets face facts: they have antioxidants for days. Bonus: raspberries give you 54% of your daily value of Vitamin C, and 41% of your daily value of manganese. 1 serving = 1 cup or 23 grams. Like I mentioned before, fiber in the seeds equals 32% of your daily fiber value. So lets gear up to have some fun Saturday! We get to have some laughs, eat great food, and maybe host an impromptu rain dance to break this dry spell! To read some great thoughts on farming at Everblossom, view our older blog entries at Field Notes.